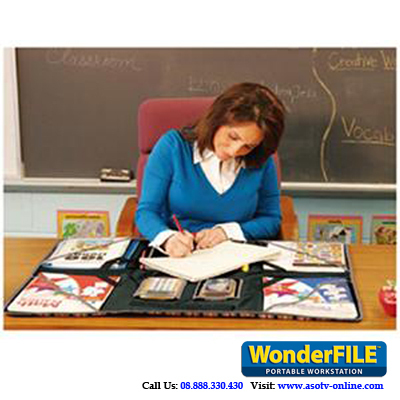 Wonderfile Portable Workstation (Black) The ingenious organizer that turns any space into a neatly, organized workplace. Wonder File is the portable organizer that folds into a drawer. A variety of clear open and zippered pockets organize important documents, receipts, bills-even calculator and laptop for an instant portable 34 x 28" workspace. 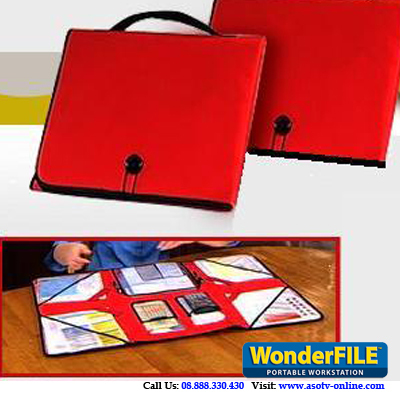 Zips shut to only 14 x 11 3/4 x 1 3/4" for storage Easily stores files, folders, papers- even a laptop! No more mess! Perfect for executives who take their work home. A convenient organizer for teachers. A must-have for moms-on-the-go. Keep your students neat & organized.